So as some of you may remember, a long long time ago in a galaxy far, far away I saw this wonderful little thread and decided to contribute a few cards. An exercise that culminated in this epic rap-up post, which you can feel free to check out, if you're still confused, to get some more background information. Anyways I left the country and went to a place where internets are few and far between, but now I'm back and I'm feeling like it's time to finish this thing. Originally I was going to do 100 cards and I ended up falling short of that goal with only 86 completed before I left. So for the next little while I'll be whiling away some of my free time making cards for various Dtoiders that I'll be picking for various reasons. Alright then, time to get down to business and make some good old fashioned Dtoid cards! 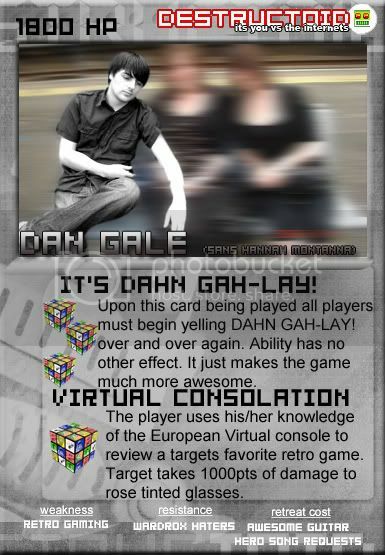 Dan Gale card notes: Before I met him this guy was one of my favorite Dtoiders, mostly because of his great comments and his love of Retroforce GO!, but that didn't prepare me for the amazingness that is DAHN GAH-LAY LIVE! For reals, this guy is almost too cool for school, and school is pretty damn cool. Don't believe me? Just read this amazing c-blog detailing which songs he would like to see in Guitar Hero: World Tour. You Can't Hurry Love? The Touch? Hold The Line? You're The Best Around? It may very well be the greatest track list of all time. As if that wasn't enough to trip your awesome alarm, he also came to Wardrox's defense just when Wardrox needed it the most. 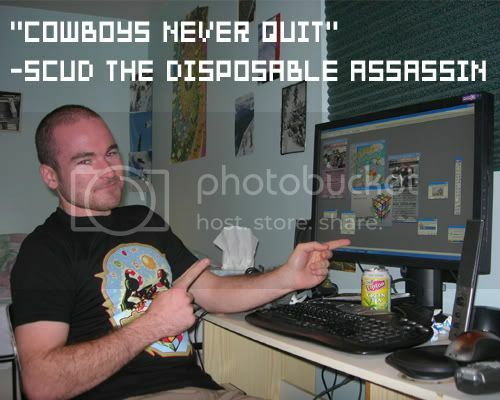 He's like a modern day Robin Hood, except for dudes that record European podcasts. I should also point out that I stole this super emo picture of Dan from Facebook, which I've used to show you what he would look like without his Hannah Montanna fix. 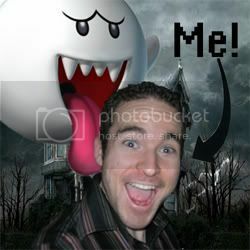 Frightening, I know! When he gets his Miley Cyrus on, he's about as upbeat as 1/2 a Chad Concelmo, which is to say that only 4 puppies are following him at all times instead of 8 and he only causes a single rainbow to break through the dreary London skyline rather than a double rainbow through the dreary LA skyline. The last reference comes from Mr. Gales attempt to stay on top of the European virtual console and post up reviews each week to help his fellow Eurogamers spend both their time and money wisely. 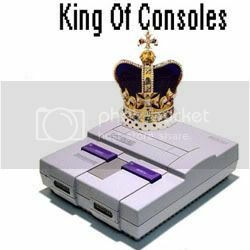 Unfortunately, and perhaps inevitably, it was both Mr. Gales money and time that started running a bit short, and so the project was abandoned, but he still has an impressive back catalog of concise, informative reviews up for anyone that needs a good virtual console recommendation. 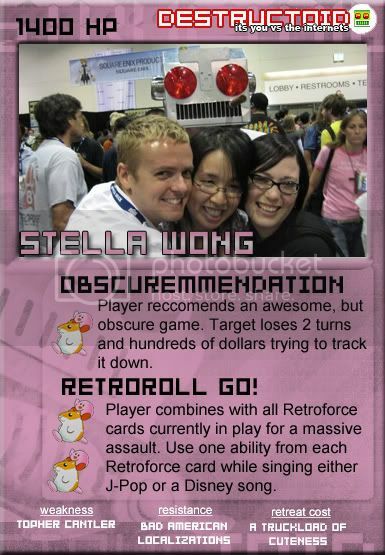 Stella Wong card notes: For those not in the know, Stella goes by the name Aiya on Destructoid, so next time you see her in the comments you'll know that it's time to shore up some RESPECT. Stella came in to become the newest member of the most wonderfullest amazingest retroest podcast that there is: Podtoid! Pictured in the card along with Stella are her fellow podcasters Chad Concelmo and Collette Bennet. Now I'm pretty sure that that's Niero in the back with the helmet, but lets just pretend that it's Topher; that way my choice of picture makes more sense. So now it's Topher under that helmet OK? SO SAYETH ME! For the ability icons I went with something featuring Rick "Pimp Supreme" The Hamster, partially because Stella really likes him and partially because I really like him. The card color scheme is a "Kirby pink" in a poor attempt to keep things consistent. If you listen to Retroforce GO! at all then you know that one of the things that Stella hates are some of the terrible North American localizations of wacky Japanese games. Whether it's replacing the music with top 40 pablum, or removing content entirely, those ham fisted localizations have got to go. On a similar topic, Stella has a stellar (cwutididthur?) knowledge of obscure games of all kinds and nary a week goes by where I don't hear of some new and wonderful game that I missed, which is great even if I'll never have the means to play many of them. Finally, Stella is notorious for her uber cute openers on Retroforce. Whether it's singing a couple of lines from a song or just saying "hi" Stella brings the cute, and the funk, every week. Some people might be wondering why there's only 2 cards in this post (I used to put up 5 in each booster back in the day). Well all I can say is that I'm pretty busy right now getting the next stages of my life and career set up (I'm moving to Australia in January for the next 5 years) so I'm writing and shooping various things (not just cards) and posting them on a "yeah this looks more-or-less done" basis. As always: there's nothing special about what I do with these cards. It's just a template that I shamelessly stole and tweaked ever so slightly. So if you got a hankering to make a card for yourself or someone else, by all means go for it. I just make these because I enjoy it and people seem to like them.